Throwback Thursdays: Memories of "The Lot"
Every young boy dreams of being famous-- usually a professional ball player of some kind or maybe an astronaut, or performer. They are going to conquer the world, discover new things, have millions of fans, break world records or be declared a hero. When I was a young boy, I did most of my dreaming where a lot of children do, on "the lot". "The lot" can mean different things to different people. It can be an empty field, common ground, or even a parking lot. In our case, "the lot" incorporated all of these as it was the Our Lady of Mercy Catholic Church Campus, occupying most of the inside of the suburban block that many of us lived on or near. It was a fairly small parish of, probably, 400 families. The campus was comprised the church building and a school with five classrooms and a multipurpose room. If you don't count the metal, shed-like concession stand, that was all of the structures so there was a ton of open space. There was a quad area between the two buildings that was kept up nicely but rarely used and a very large area that we just called "the hill" but it was really just a slightly sloped piece of land, running from the school down to the street that was supposed to be used for a gymnasium that was never built. The athletic field and the large parking lot took up most of the rest of the space. I always thought the parking lot was extremely large for a parish our size as I don't think I ever saw it more than 3/4 full-- even for Easter Vigil. All that space made for a huge amount of room to play. Kids today don't play like we used to. They need a coach and a referee and a permission slip to play. They need warm up exercises and family members in the stands and they need a cool, healthy but tasty treat after they formally line up and parade past each other slapping hands and chanting a monotone, "good game, good game, good game...". I can think of maybe nine days that I wasn't up on the lot, after school when it was in session and, basically, all day in the summer, from the time I was able to leave the front yard and cross the street on my own until I was able to drive. We would all congregate, choose up teams and play until the fight broke out or it got dark, at which point we would drag all of our stuff home until the next day when we would do it all over again. There was no schedule-- no set time to start. Everyone would just show up and as soon as we had enough to play it was go time. If you showed up late, you sat out until another came to make the teams even or were designated, "all-time-hiker" (or catcher, or goalie). Captains were usually the two oldest, biggest or the best athletes and the last person picked was probably the youngest, smallest and most uncoordinated. This practice may seem cruel, by today's standards, but I prefer it to giving every kid a trophy just for showing up. It was honest and let you know where your strengths and weaknesses were and made you determined to improve. Everyone was playing for themselves. There were no parents to make proud or girls to impress except the ones that were playing with us and we were an equal opportunity organization-- the girls were treated like boys. This, generally, made it all fair and fun. Disagreements on the field were kept on the field. We called our own fouls and made our own penalties and if we had a problem working something out, as a last resort we had a "do-over". More often than not a escalating disagreement, bordering on a fight, would end the game for the day but because there was no clock we needed something to mark the end of the day. After all, we still had to make the trek home before the streetlights came on and, back then, we didn't have cel phones that we could use to call Mom and have someone pick us up. There were no set seasons for particular sports on the lot either, although we were more likely to be playing Indian Ball than Roller Hockey in the dead of summer and we would usually stick to one pastime for a week or two before we got bored. We tended to mix it up pretty much but, living in Soccertown, USA, we naturally mix in a little more of that the the others. "The field" was in pretty poor condition through most of the year. The infields had no grass and it was sparse and clumpy in the outfields. 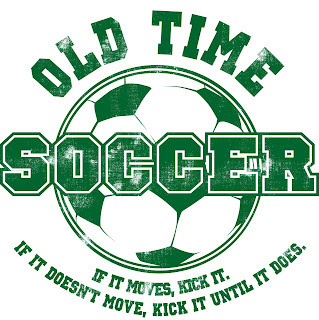 It was set up differently for baseball and soccer through parts of the year but we could do either at any time. We would usually play soccer on the quad though because it made it tough to run the whole field with less than eight or so guys per team. Hockey was played at the far end of the parking lot where it was not unusual to see just as many skated players as those in street shoes playing together. This is also where the basketball hoops were located. Although it was set up so you could play full court, we rarely played anything more than HORSE or "around the world". "The hill" was where would normally play football. A quick poll of the available players would determine whether the game would be tackle or touch and with a real ball or the Nerf. We would also fly our kites and, when it snowed, sled on that hill, not that I would consider them sports, but it was cool because every kid in the neighborhood knew that was the place to be. I wouldn't really consider Fenceball a sport either, but we played it more than any of the other stuff. I have no idea where Fenceball came from. For all I know, it was played only at OLM by only the kids on that lot. I'm not completely sure that my friends and I didn't invent the game. All I know for sure is that I kicked that ball up against that fence more times than I can begin to count. I kicked it with friends, strangers and by myself. I kicked off the bomb (a bad thing) and I kicked it off the post (a good thing). It is a very simple game with almost no rules-- you get one-touch to make the ball hit the front of the backstop fence (without using your hands). If you miss you are out and last one in... wins! There were variations over the years that, for the sake of time, I won't get into here and now... maybe on a future post. Still, to this day, some 25-30 years later, however, I can still visualize every inch of that dusty field-- especially the screen and the infield where we played Fenceball. I still dream, literally, of playing on "the lot" and conquering the world, discovering new things, having millions of fans, breaking world records and being declared a hero. I wonder if the others that played like that have as fond of memories as I do? In the case of our lot, they can be bittersweet memories because the lot doesn't belong to OLM anymore. Reorganization of the Catholic parishes in the area left it vacant and it was eventually sold to the public school district. I still drive by every once in a while and even stopped a time or two. They have left it, pretty much, unchanged-- yet it is very, very different. Several years ago, I started writing my life list-- things I wanted to make a point of doing in my lifetime, but I put it aside, unfinished, a short time later. When I had the stroke, I guess because it was a reminder short a lifetime is, I dug it back out. The first entry on the page is "Go up to the lot and play Fenceball with my son." ...he may even declare me a hero. 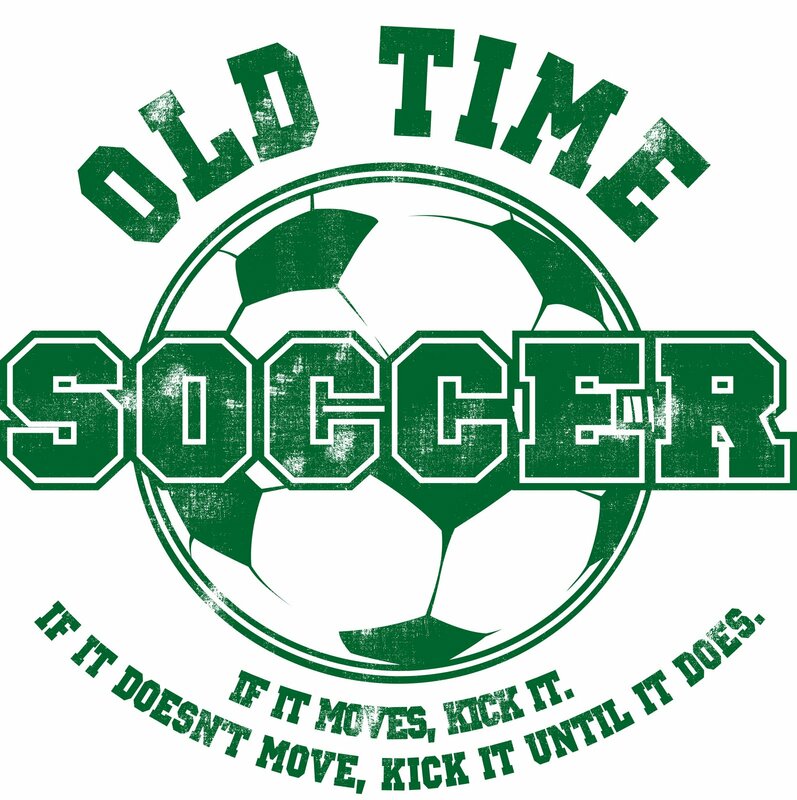 Check out the latest addition to the Old Time Sport Series: When it was more than a game--Soccer: If it moves, kick it. If it doesn't move, kick it until it does. There is a whole lot to go over and I am certainly not going to be able to do it all in one day– I have work to do. But I do realize how important writing is on so many levels so I am really determined to get back into it. My plan, going forward, is to publish three original posts per week and a repost on Throwback Thursdays. 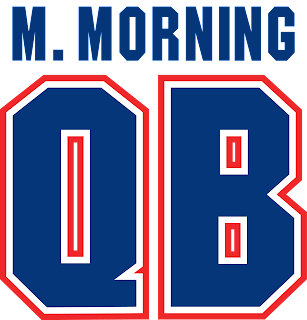 We will do the old Monday Morning QB (obviously) on Mondays and Things We Like/Let's Roll on Fridays with another cool feature on Tuesday or Wednesday. How does that sound? I need to explain all the changes that have gone on in our life over the last four years but, as I said, it may take some time to go ever all of it. I have gone into business for myself- The biggest single thing and reason for me not having time to post is A Skeetz Production, LLC. It has been a tremendous challenge but a gigantic blessing at the same time. I will write about the experience and so many things that I have learned that I want to make others aware of in the near future but as difficult as it can be, it has been one of the best decisions I have ever made. We have Guy- I have never thought it best for my family to publish the names of my boys but I have two of the best young men that seem to grow up so fast every day. I love them more than I could have ever imagined and if I wasn't so old, I would have a half dozen more. I'm sure that I will have a lot to write about those experiences too. Facebook- and such... I was just getting into Facebook, LinkedIn and then Twitter when I stopped writing in the Blog. I actually have a draft with a bunch of notes that I had on the new technology from over four years ago. I have lots to say about social media and how it has become such a huge part of our lives. I will quickly try to figure out how to incorporate the Blog with all the other social media that I am involved with. I would like to invite you all to follow this Blog by subscribing at the top of the right column and to check out other articles listed by topic further down in that column. I was just looking over my blog posts and I, literally, have seven articles that I have started over the last three weeks that I have not finished. I feel bad that I haven't gotten anything done but, between being sick, things picking up at work and last minute preparations for the coming baby, I just have not had time. 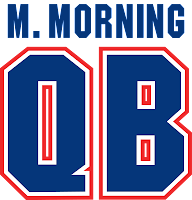 I have a tendency to jot little notes to myself during the week and then put them together in a weekly review of sorts called Monday Morning Quarterback. I keep most of these notes in my back-left pocket but there are so many that they are overflowing to other places and it has been so long that I don't understand what some of the inscriptions mean when I run across them. I have decided that I have to take a few minutes to record these thoughts before I lose them forever. Who knows? I could have a fleeting million dollar idea in here somewhere! • I have this thing about people getting in my pockets. I won't even let MLW or M3S get in them whether my pants are off or on. I also transfer everything in my pants pockets that I am taking off to the pockets of the pants I am putting on every time. - I didn't know more artists than I knew. - Do you think anyone tells Stevie Wonder how silly he looks with all of his hair pulled back into the back one-third of his head? Is that from so many years of wearing those tight braids? - Speaking of silly: All of the under-age artists look ridiculous. Just because Disney gives you enough exposure that millions of kids idolize you, does not mean that you have the talent to be able to even carry the amps of the legends that you are being allowed to share the stage with. - Kanye (Twitty) West looks like he is going to a 1986 prom. What do they call that hairstyle-- a frolet? - I like to listen to British people speak-- not only because of the accent (although it is cool) but they have a casualness about them that I enjoy. - Whitney-- say no to crack! • It is absolutely amazing to me what women will say to you when they understand that your wife is pregnant. When I was single, there is no way that they would ask me anything as personal as they seem to think it is OK to do now! • I expected the baby to show up today because we have a music trivia to do tonight, but it looks as if he is going to take after his mother's side of the family and show up late. • The only thing cooler about this time of year than it being trivia season is the fish fries will be starting in a week or two. • I promise to burn my firewood where I buy it. • Are three-year-olds supposed to have a vocabulary that includes words like actually and really and are they supposed to understand how to use those words in the right context? • I have several new designs in the works and have made available a classic T-shirt from the movie, Can't Buy Me Love, starring a pre-McDreamy, young Patrick Dempsey as Ronald Miller. • This Facebook thing is really cool but I don't know how healthy it is as it can be very addictive. It took me a while to join but now I like Mafia Wars a little too much. • If I ever start writing regularly again I will have to do a feature on Facebook because I am studying several books on Social Networking and have developed some pretty interesting theories on the whole concept. Okay, it is now Wednesday. I started writing this post last Friday and am frustrated enough, at this point, that I am just going to publish it as is. The baby is due tomorrow and I feel that we have just hit the pause button on the remote control of life and we are waiting for MLW to go into labor. I have got nothing done in the past week because I am having a terrible time concentrating on anything and this blog story is a perfect example. I'm going to count this one as done and post it because I have to, as Walt Disney would say, keep moving forward! Read this. Buy T-shirts. Peace. 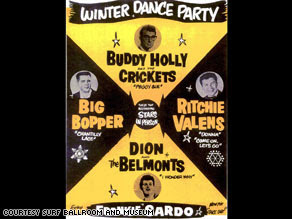 Fifty-years ago today, news was broadcast about a plane, on it's way to Fargo, North Dakota, that went down in bad weather new Clear Lake, Iowa taking the lives of J.P. "The Big Bopper" Richardson, 28; Ritchie Valens (originally Valenzuela), 17; and Charles Hardin Holley, 22, better known as Buddy Holly. A tragic story, indeed but, having occurred nearly a decade before my birth, I didn't feel that the event impacted my life in any way-- even though I had a great interest in music... especially Rock 'n Roll. The sad event, however, did influence Rock 'n Roll and many of the early artists that would leave a mark and, in fact, lay the foundation and several of the main-floors of the giant structure that the music has become in pop-culture. Legends such as Paul McCartney and John Lennon from the Beatles, Bruce Springsteen, Elton John, Eric Clapton, and Rolling Stones-- Keith Richards and Mick Jagger have declared Buddy Holly a foremost contributor to the success of Rock 'n Roll and a major influence on their own career-paths. There have been two movies made that recount events in the lives of the men leading up to the accident. The 1987 film, La Bamba, gave Lou Diamond Phillips, playing Valens, his big break and 1978's, The Buddy Holly Story, even earned, crazy-man, Gary Busey, an Oscar nomination for his role of Holly. Although some of the facts have been altered for dramatic effect, either flick is worth a rental on a Saturday afternoon or weeknight. These motion pictures brought the story of the musicians to people my age and younger some 20-30 years after their death but many in the mainstream had heard the story before in song. Though they may not have realized it, Don McLean tells us about it in his 1971 hit, American Pie. The song is an abstract story of his life and Rock 'n Roll's part in it that starts with the accident and ends in 1970. The eight-minute 33-second song is the longest in Billboard's history to make it to number-one and spent four-weeks there in 1972. Because of it's length, Top 40 stations would originally only play the shortened B-side, but the song's popularity eventually forced them to play the whole thing. It is now considered a rock anthem and it's importance to America's musical and cultural heritage has been recognized by many sources. When I was a Freshman in high-school, I wrote a paper on the symbolism found in the song. At the time, I had to spend many hours in the local library, researching scholarly interpretations of the lyrics. Today, on the Web, everybody and their brother is ready to explain what they think it means. This, for one reason, is why I will not bore you with my analysis (the other reason is... I'm not sure what it all means) but this one is pretty good if you should want to check it out. When they asked the writer what it all meant, McLean replied, "It means I never have to work another day in my life!" On a more serious note he claimed, "...long ago I learned that songwriters should make their statements and move on...", though later he did admit to hearing about the plane crash while folding newspapers to be delivered on his paper route on February 3, 1959. I like that because, when you think about it, everyone is going to have their own interpretation of any song, or piece of art, or event, or conversation and even if I tell you what mine is-- it isn't going to change what it means to you... or at least I don't want it to. So... I'll be moving on now. ...and the rest is Rock 'n Roll. Read this. Buy T-shirts. Peace. There, that's better. It is pretty amazing how that works. Certain recordings can take you to happy places and better times in the same way that a picture can, or a smell or taste. All of our senses have the ability to affect us physically, mentally and emotionally, but music goes a step further by blocking out other distractions. As a performer, I have had firsthand experience seeing how music can affect, effect and infect people. For some it may be a rock 'n roll song that "pumps them up", almost to a point of an aggressive frenzy. For others it may be a mellow ballad that makes them cry or a peppy pop tune that brings a smile to their face. Christian music and religious hymns can be very powerful, bringing the listener to their feet in a moment of joy and classical music or other genres can be very spiritual, as well, to some. It is very different for every person, but I think everyone has some degree of instinctual, internal rhythm that is keeping time to a song in their head. Having dealt with many challenges with anxiety, I have a collection of songs categorized by attitude adjustments that they bring on. Music to help make me happy, relaxed, energized, concentrate or reflective is all grouped in different playlists on my computer. My calming tunes have even been burned to a series of CDs so I can listen to them in the car-- to prevent road rage or at the office-- to prevent work wage. I also have other song sets that I listen to if I want to get in the proper mood to do something like workout, mow the lawn or get romantical. I love the idea of playlists because it reminds me of the mix-tapes that we used to make before the Internet age and the invention of the CD burner. A mix-tape is a group of songs recorded to cassette tape with the intention of reflecting the producer's chosen theme. Anyone could make them with very minimal equipment and with vinyl, 8-tracks, cassettes or even compact discs but a true mix-tape artist would toil hours-upon-hours to get the best possible reproduction of the perfect, 60-minute, combination of tracks. Mix-tapes have been around since the early 1970s when compact cassettes were made readily available to the public and hit their peak in the 80s and 90s before fading away in this millennium when consumers were able to record music, as well as data and video to compact disc. The amateur recordings were vaulted into mainstream pop-culture with the release of the 2000 film, High Fidelity, starring John Cusack and based on the novel of the same name by Nick Hornby-- a great flick that I would highly recommend, especially if you, like me, are a big fan of Cusack. Some would argue that the CD Compilation is the mix-tape of today, but the purist knows that the shiny silver discs could never live up to the small, twin wheels of fragile, thin tape embedded in that smokey, plastic shell and that no one could cue a song with a pencil, blindfolded, with one hand tied behind their back, as well as them. Today, as with many other days, this went a different direction than I intended. Visit How to Make a Mix-Tape if you would like to read more of what I have to say on the subject. Be sure to check back soon when I will post the article that I was planning or writing about how the music of today and the music of the past is impacting each other. Until then, Read This. Buy T-shirts. Peace. 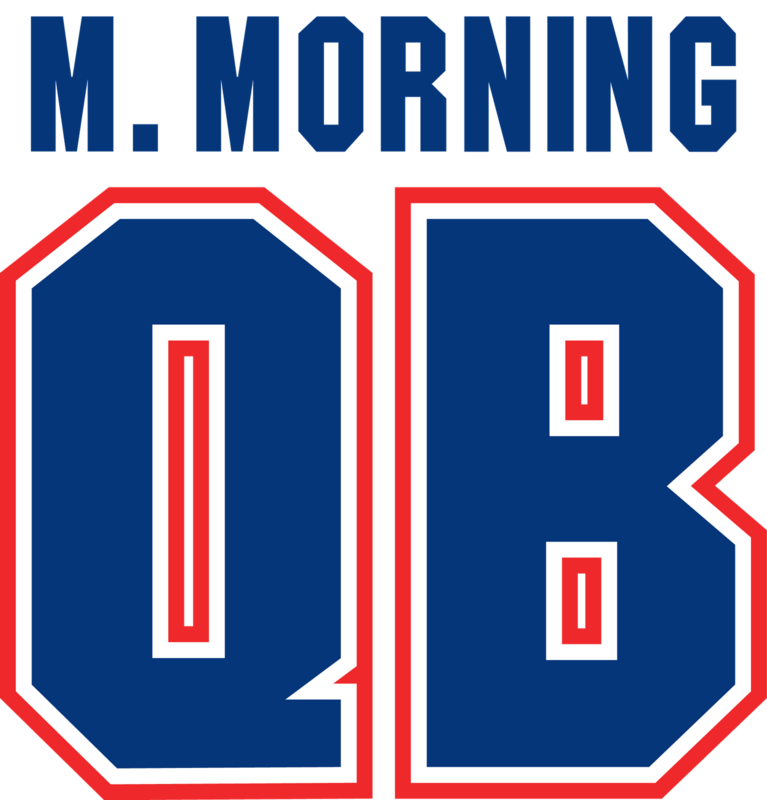 Although I spend about three-times as much time on the other articles, these quickie little Monday Morning Quarterback postings are getting all of the attention. The 17 collections of thoughts that I usually throw together during my Monday lunch hour have had more readers than the other 70 stories collectively, that sometimes take me many hours over several days to complete. This doesn't bother me because I enjoy either one as much as I do the other and I have learned, over the years, that a client (or your boss,or the public, or any end-user) doesn't care how much time you put into something. They are only concerned with the end product and if they like it or not. In fact, I will put as much effort into a project as is needed, but I usually start with a "less is more" philosophy because if the end product is the same no matter how much you put into it you might as well save that extra energy. • Being from St. Louis and a Rams season ticket holder, I have seen a lot of mixed emotions in this town about the Superbowl this year. Most people love Kurt Warner on one hand and, I think, most dislike the Cardinals and their ownership on the other. Either way, it is really a great story and, I hope, it will be a great game. • A couple of times, while hearing reports on the plane crash landing in the Hudson River last week, I heard correspondents corrected when they said Canadian Geese. Apparently, the proper name of the bird is Canada Geese. I'm not sure if it was the Canadians or the geese, but one of the groups was upset (I guess they didn't want to be blamed for bringing down that plane) and was sure to make a point of it. • In similar news, in order to be certain to not accuse any other countries of involvement in accidents with non-resident subjects, we will refer to so-called subjects in the non-possessive vernacular. For instance: France Toast, Germany Potato Salad, India Giver, Brazil Wax and Poland Sausage. • Just to remind me of how soon our little baby boy will be here, MLW's cousin went into labor two-weeks early on Saturday. Welcome Olivia Joy. On our way to visit baby and Mom, my wife mentioned that M3S and she could marry because they are forth-cousins but I quickly convinced her that these families are already screwed-up enough to start messing with the gene pool any more than we already have. • Talk around the Sunday Dinner table last night (after we were finished eating) turned to babies and deliveries and C-sections and stuff. The only one at the table that had not been through a birth but was still able to understand what we were discussing was my 22-year-old niece, who commented, "I wish we could just throw them up!" As freaky of an experience natural birth was-- and I wasn't even the one having the baby-- her idea may be even more bizarre. • My Mom thinks I should write a book called Sunday Dinner. I explained to her that I am basically doing that by writing in this blog. I think she would enjoy reading it but she refuses to own a computer... or fly in a plane. • Barrack Obama's Inauguration price-tag is somewhere around $150 million for four-days of events with 1.5 to 3 million attendees. This is more than three-times the amount that was spent for the most recent Bush bash and more than five-times the amount for Clinton's first-term inauguration bill. I don't feel like messing with the math but I think that is a more expensive ticket than the Superbowl... and I would think the taxpayer is taking care of the bill. Where are our priorities? • I understand that they are re-naming Delmar in our fair city-- Barrack Obama Boulevard. This for a man that has not served a day in the presidential office yet. You would think that the St. Louis planning commission would have learned their lesson from when they named a stretch of I-70-- Mark McGwire Highway, only to have the muscle-bound slugger lay an egg in the Congressional hearings on steroid abuse in baseball. • Do not try this at home... or anywhere else for that matter... and don't read this one if you have a weak stomach. I recently heard of a disgusting (even by my standards) practice young people have been participating in order to get high. They actually poop in a bag, let it ferment for a while and then snort the fumes produced. What is the world coming to? We did some pretty stupid things as kids for some pretty stupid reasons, but none even close to this stupid! I have a real hard time believing this one because if someone asked me to come up with the most gross, disgusting, stupid thing in the world, I would have a hard time thinking this up. Why can't they use this energy and experimentation with methane gases to develop alternative fuel choices-- if your going to play with poop-- it should at least be for a good cause. • Similarly, I can't believe that their is a certain frequency that only humans under the age of 18 can hear and that they are making ring tones in these frequencies for the kids' cel phones. I believe that this is a giant conspiracy that has gone mainstream with stories on the national network newscasts. Millions and millions of kids across the globe are laughing at all the big dumb adults behind our backs. It is like a giant 21st-Century snipe hunt. • I was looking at my niece's friend's and my sister's pierced noses yesterday and noticed something peculiar (I mean something besides the fact that my sister is 41-years old and has her nose pierced)-- their piercings were on opposite sides. I thought this might be another one of those things that I didn't know about because I was old but, because my sister too was old, this may be my opportunity to get an honest answer and I asked what was the significance of the locations. She gave me some long drawn out explanation of how a young girl of Indian descent told her that her mother told her about the meanings in ancient India and it turns out that there is no difference in the meanings of piercings on the left or right side of the nose... they both mean that you're a hussy. Oh well. Read this. Buy T-shirts. Peace. The mercury was just creeping up over 2-degrees this morning when I rolled into work-- coldest temperature in St. Louis in over 10-years. As I turned the corner past the receptionist and down the main hallway toward my work station, I was unwrapping myself from the several layers of scarves, coats and hoodies, when I stopped, face-to-face, with a young man coming out of the break room with his cup of warm beverage of some kind. I was certain to pardon myself as I did not want him to spill on himself, the floor or, most importantly me, and quickly went on about my way. As far as I was concerned, a long, drawn-out conversation was not needed because, although this guy had worked in our office of about 100 employees for a little over a year, I knew his name and said, "Hi, how you doin'?" in passing before, we didn't really work together or socialize, we had nothing in common, I was running a little late due to a stalled car on the highway and I am not big on the small talk, anyway. He just couldn't leave well enough alone, however, and had to come back with the witty, "Cold enough for you?" I stammered for something to say, not expecting to be presented with such a deep question at 8:02 A.M... "No, I was hoping we would get to see negative numbers today"... "It's not the cold, but the humidity, that will get you"... "You know that is 14-degrees in dog-temperature"... didn't come to me until later. All I could think of at the time was, "Yeah, Buddy!" followed by a, "you, tool"... under my breath. Why can't anyone just go about there business and not say anything when you don't have to? Why is it that, when found in an uncomfortable situation, we often have the need to just blurt out the first thing that comes to mind? 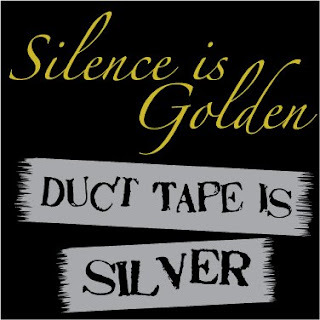 Has the phrase Silence is Golden lost it's impact with the falling prices of precious metals? I had only been working-out at the YMCA for about a week when I realized that there was an unwritten routine and an etiquette that one needs to follow. Among other things, certain people are in certain places and doing certain things at certain times-- like clockwork. It didn't take too many dirty looks before I figured out that, at 6:05, treadmills #4, 5 and 9, and elliptical machines #1 and 6 are available, but by 6:15 all of the ellipticals are being used, however, treadmill #5 is still open and #6 and 7 have opened up, too. It took a little longer to grasp the pecking order in the locker room. Grown men can be pretty territorial when it comes to changing spaces. It is best to search for a spot without padlocks on, at least, four adjacent lockers, in each direction. In addition, you should try to keep to yourself and never speak unless first spoken to. You may, however, give a head-nod or hand-raise, accompanied by a low-volume and -tone grunt or an inaudible, questioning mumble as a salutation upon coming or going. After two-and-a-half months of-- over-an-hour-long workouts, five-days-a-week-- not talking to a single soul, I really thought that I had become invisible or something. Perhaps, since it was early, I had morning breath, but I never opened my mouth enough for anyone to get a whiff. Can people really go for months without interacting with anyone? Maybe it just takes a while for individuals to warm-up to each other and feel comfortable sharing conversation? It could just be me, though, because I have actually seen people in the gym talking to each other, and on one occasion I could even hear words coming out of their mouths and smiles on their faces! With the holiday upon us, the Y was going to take care of some maintenance issues while they were less busy between Christmas and New Years. Among the things on their "to-do" list was replace the shower heads in the men's locker room, so they shut down half of the plumbing at a time to make repairs. Although there were, definitely, less people working out during the holiday, it was still a bit crowded in the very early morning and with some of the facilities unavailable, the guys were cramped in the tight quarters. Instead of leaving one or two stations between bathers, some were forced to do the normally unthinkable, and shower right next to another man. I wasn't too very freaked out about this as, since I was exposed to a lot of new experiences when I had the stroke, I had become much less inhibited. I couldn't help but feel a little uneasy, though, when the dude that was always friendly to everyone else but me, pulled up to the shower-station next to me and said, "How you doing? I'm John." In my shock and embarrassment, I was unsure if he stuck out his hand and I was too afraid to look so I just squeaked out out a quick, "Good. Scott." and went on about my business. Is it considered rude to not shake the hand of a naked man? It has been awkward and we haven't said a word since-- just the occasional head-nod and grunt in passing. I'm not sure if you understand or not. There are rules! Men do not visit the bathroom in pairs like women. They do not speak to each other or look anywhere but straight ahead when they are using a urinal so I would assume that the same would also apply to public showers. Maybe he was from a different Country or something? About a year ago, I was still in therapy but progressing very well so they put me in a group psychology session that met every Friday at lunch-time. The group consisted of usually 6-10 other patients that had suffered brain injuries of some kind and were getting ready to get back into their everyday routine in the real world so there was a variety of people attending in the eight-weeks or so that I participated. On this particular Friday, I was dropped-off by my driver a bit early which was both unusual and advantageous because I really had to use the restroom. I did my best to limp past the meeting room down the hall towards the lavatory as quickly as possible when I approached a guy that I recognized as being part of the group but he had not been there in several weeks. I gave him a head-nod and a "how-ya-doin'" as I hobbled past him and he mumbled something back that I didn't pay attention to as I reached my goal and turned into the bathroom. I entered the middle of three stalls with a big sigh of relief that I held back as I heard the door squeak open and someone else come in. I sat quietly and, through the space between the door and the frame, saw the gentleman, slowly passed my stall and occupy the one right next to me-- serves me right for picking the middle one. I now tried to delay my business as I didn't want to draw attention to myself with someone sitting right next to me. And then he said, "Hey, how you doing?" Stunned I replied, "Pretty good... How are you?" not thinking that the conversation would go any further... but it did... "Alright. So what are you up to?" OK, so this is really freaking me out and I thinking, "Don't answer. This is nuts. Don't answer." But I say, "Well, I have a group psych session and had a few minutes to kill so I thought that I would come in here and take care of my busin..."
"Hey, I'm going to have to let you go because there some moron in the stall next to me that thinks I'm talking to him. I didn't even finish what I started and left as quick as I could without making another sound. I was glad that none of my group partners were there to see me make a fool of myself. As we were getting ready to start, the guy that I saw in the hallway came in, plopped himself down in the chair next to me and said, in a very familiar voice, "Hey, how you doing?" We had a good laugh about it after the session and then I never saw (or heard) him again. I know this story is so good that it sounds like a joke. In fact, someone emailed me a similar story, shortly after the event occurred. The only proof that I have that it really happened is that guy that was there-- maybe he started the email about me. Sometimes it's just better to say nothing. Had a stroke in November of '07 and have made an amazing recovery to near 100%. I am an artist by profession and, since the event, am looking for outlets for creative inspiration. It all started with T-shirt design and will end somewhere else.